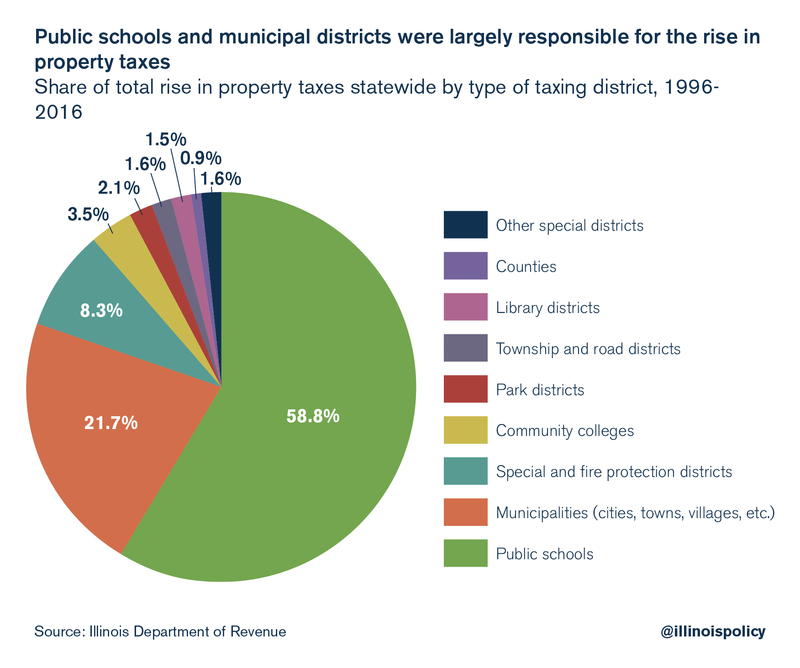 3: Where do Illinoisans’ property tax dollars go? State funding for schools does explain much of residents’ high property tax burden, but the key question to consider is: Where is that money going? In Illinois, although teachers and school administrators aren’t state employees, the state government is required to make contributions to the Teachers’ Retirement System. Government data show billions of additional dollars in state education spending over the last 20 years has flowed disproportionately to TRS rather than the classroom, putting pressure on local governments to pick up the slack. The state’s contribution to education increased more than $5.4 billion from 1996 to 2016, an 87 percent jump. But 66 percent of that increase – $3.6 billion – went to teachers’ pensions instead of the classroom. Adjusted for inflation, property taxes for school districts went up 66 percent during this time, according to the Illinois Department of Revenue. Much of that increased property tax burden could have been avoided had the state’s pension contributions gone to classrooms instead. Municipal property tax levies explain the next largest share of the rise in property taxes. Among municipalities’ most critical functions is the provision of police and fire services. However, the growth in spending on police and fire pensions has far outpaced the increase in spending on municipal police and fire protection services. 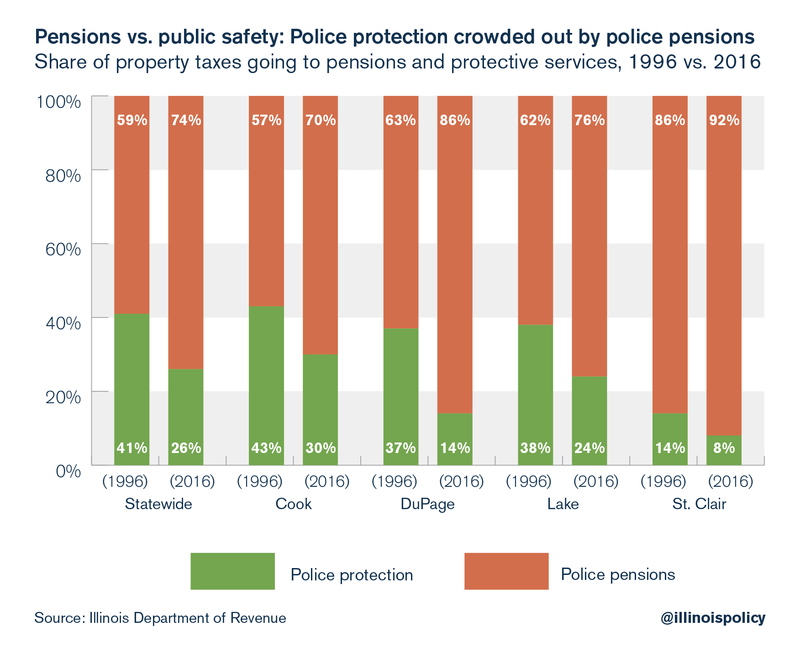 From 1996 to 2016, Illinois property taxpayers sent an additional $396 million to police departments, but pensions consumed a vast majority of these funds. Statewide, 81 cents of every additional property tax dollar for police departments – more than $322 million – went to pensions rather than police protection services. This picture is particularly stark in St. Clair and DuPage counties, where 95 percent and 98 percent of additional funds for police departments went to pensions, respectively. The same trend holds true for fire departments, which levied an additional $260 million in property taxes from 1996 to 2016. Most of that money went to pensions. 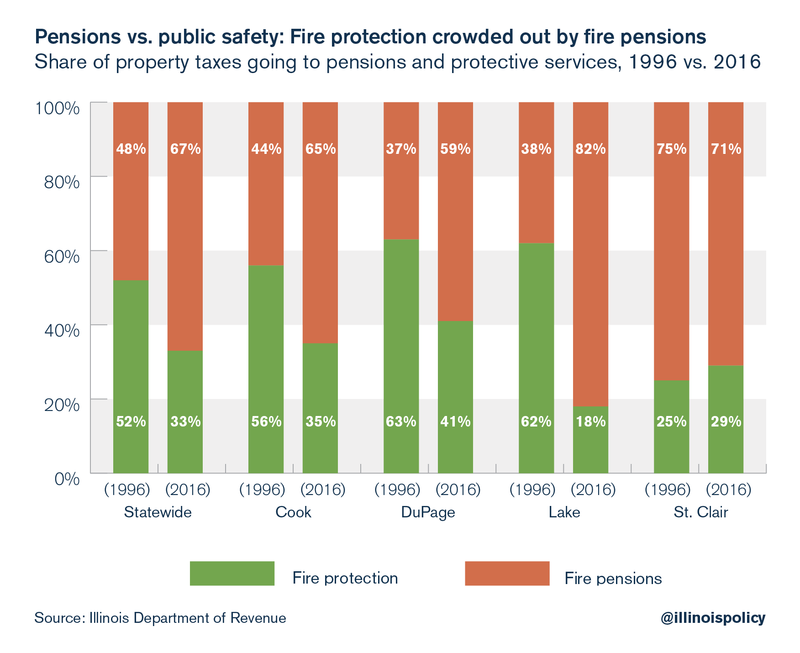 Statewide, 78 cents of every additional property tax dollar for municipal fire departments – more than $200 million – went to pensions rather than fire protection services. In Lake County, residents saw funding to fire departments cut by $3.6 million while funding for fire pensions increased $12.6 million. The increased share of spending on pensions relative to services is reflected in the sluggish growth of home values in Illinois. All else equal, when rising property tax dollars do not go toward valuable current services, the desirability of a neighborhood does not increase and the return on housing investments declines, making home ownership less appealing. Property taxes raise the cost of home ownership, and if there’s government waste or if the revenue doesn’t enhance services, this can depress home sales and slow home price appreciation. 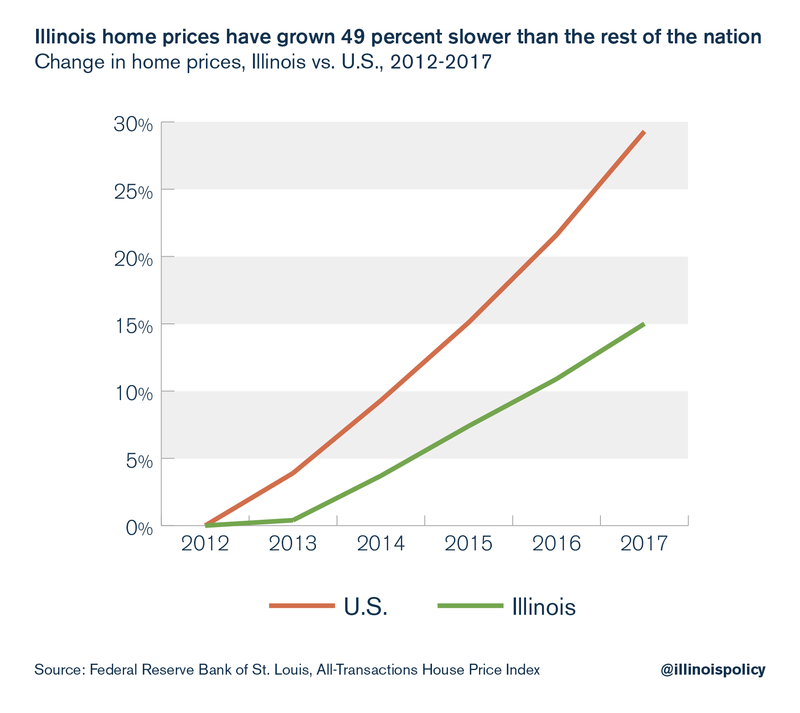 Since the housing market began its recovery in 2012, Illinois home price growth was 49 percent slower than the national average. Property taxes have been rising faster than home values can keep up. If Illinois is serious about providing meaningful property tax relief, the state must deal with its pension crisis. If pension spending had simply grown at the rate of inflation since 1996, Illinoisans’ property tax burden would be nearly 20 percent lower than it is today. 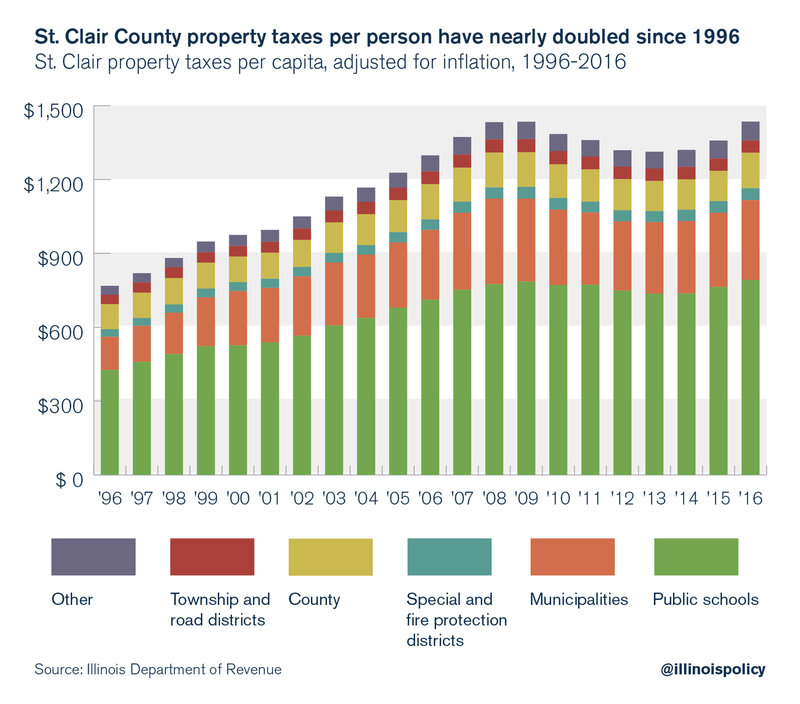 And if all property tax levies grew at the rate of inflation since 1996, Illinois’ average effective property tax rate would be hovering just above the national average at 1.27 percent. (This is without any change in the appreciation of home values under a less burdensome property tax system.) Instead, Illinois homeowners are shouldering some of the highest property tax bills among all 50 states, with a median effective property tax rate of 2.29 percent. That burden cannot be lowered without a reduction in the pension liability. Whether in the form of legislation, a constitutional amendment or a Supreme Court decision, property tax relief means a decrease in Illinois’ pension liability. Any reform that fails to reduce the burden of pension costs on taxpayers will hit Illinoisans via their single largest investment – their homes. 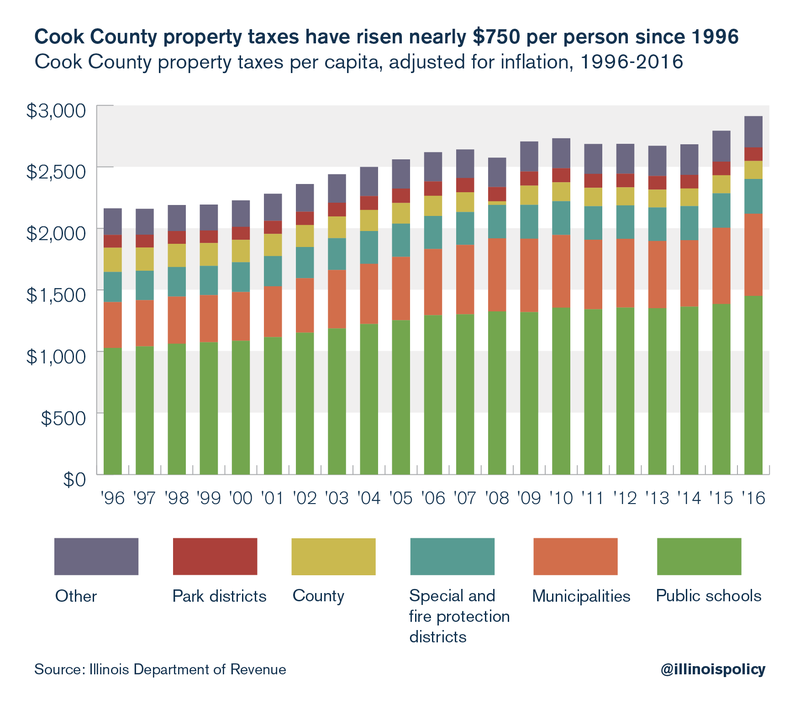 In Illinois, property taxes rose 52 percent between 1996 and 2016, adjusting for inflation.5 However, much of the rise in property tax dollars did not go toward providing beneficial public services. Instead, a large share of the increase can be attributed to pension contributions at the state and local level. This additional spending does not find its way to the classroom or toward other essential services. As far as the property taxpayer is concerned, it is essentially wasted. As spending on teachers’ pensions have increased, state funding for public school classrooms now makes up a smaller share of overall education spending. That means local governments must raise property taxes to make up for the share of state funding that is diverted from the classroom. Municipal district levies explain the next largest share of the rise in Illinois property taxes. Pensions are crowding out the police and fire protection services provided by these districts. Higher property taxes year after year to pay for pensions is a losing proposition for homeowners. The extent to which property taxes have risen faster varies by county. 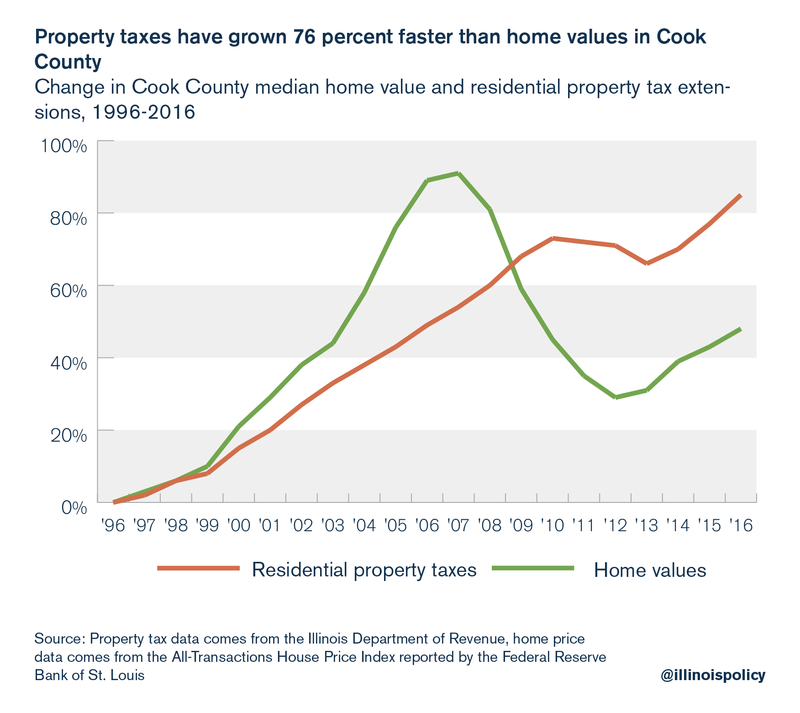 Since 1996, residential property tax extensions have grown 76 percent faster than home values in Cook County. 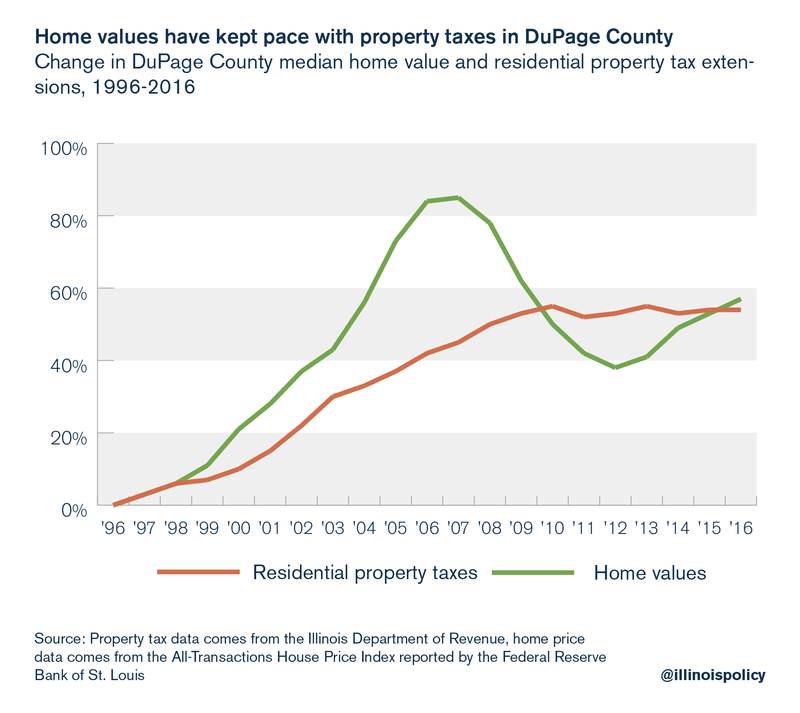 Fortunately for DuPage County, residential property taxes have grown slower than home values. This is because local authorities have put the brakes on property tax levies since the recession, allowing home values to catch up. Lake County homeowners saw their property tax extensions rise 161 percent faster than the value of their homes in the past two decades. Even during the housing boom, residential property taxes outpaced home price growth. 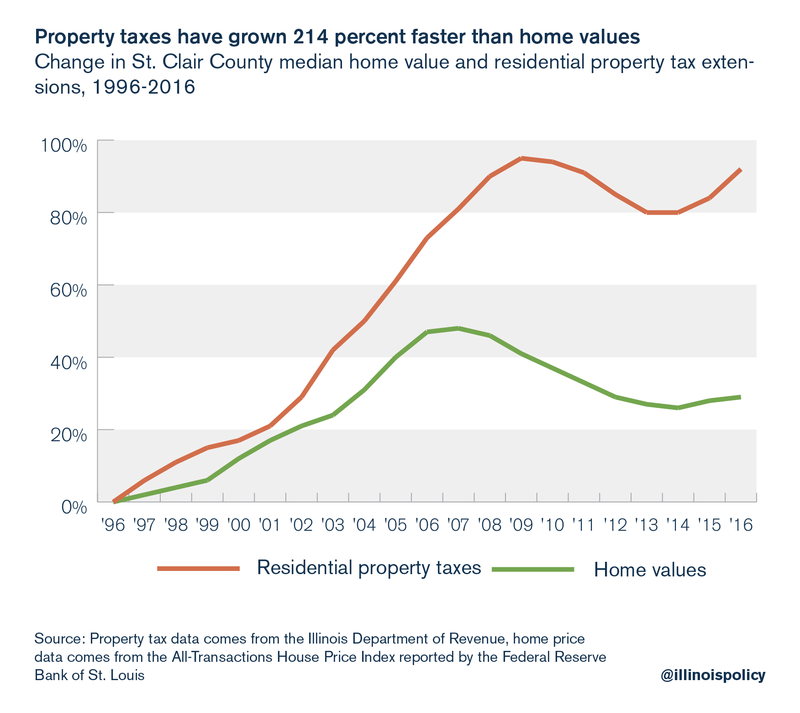 St. Clair County homeowners suffered the most drastic difference between growth in home prices and property taxes in the past 20 years, with residential property tax extensions rising 214 percent faster than the value of homes. Where do Illinoisans’ property tax dollars go? Property taxes have risen dramatically across the Land of Lincoln over the past 20 years. Statewide, property tax extensions rose 52 percent from 1996 to 2016 when adjusted for inflation, with the rise stemming mostly from school districts and municipal districts. Which taxing bodies were responsible for increased property taxes? Nearly 59 percent of the increase in property taxes went to public schools, 22 percent went to municipal governments, 8 percent went to special and fire protection districts, 3.5 percent went to community colleges, and the remainder was dispersed between township and road districts, park districts, library districts, other special districts, and county governments. The rise in property taxes isn’t isolated in just a few counties. Most counties across the Prairie State saw their property taxes skyrocket over the past 20 years. Where did all of these new revenues go? Decomposing the growth in property taxes in Cook County reveals that public school levies were responsible for 56 percent of the increase in the property tax burden, municipal district levies explain 39 percent while the remainder was spent on special districts, park districts, sanitary districts, libraries, forest preserve community colleges and townships. In DuPage County, public school levies were responsible for 69 percent of the increase in the property tax burden, municipal district levies explain 11 percent while the remainder was spent on special districts, park districts, sanitary districts, libraries, forest preserves, community colleges and townships. In Lake County, public school levies were responsible for 67 percent of the increase in the property tax burden, municipal district levies explain 14 percent while the remainder was spent on special districts, park districts, sanitary districts, libraries, forest preserve community colleges and townships. In St. Clair County, public school levies were responsible for 55 percent of the increase in the property tax burden. Municipal district levies explain 28 percent while the remainder was spent on special districts, park districts, sanitary districts, libraries, forest preserve community colleges and townships. Illinois’ property taxes are clearly growing at unsustainable levels. But critics of cost-saving reforms claim this is due to the state not contributing enough money to public education, forcing local school districts to raise their property tax levies. 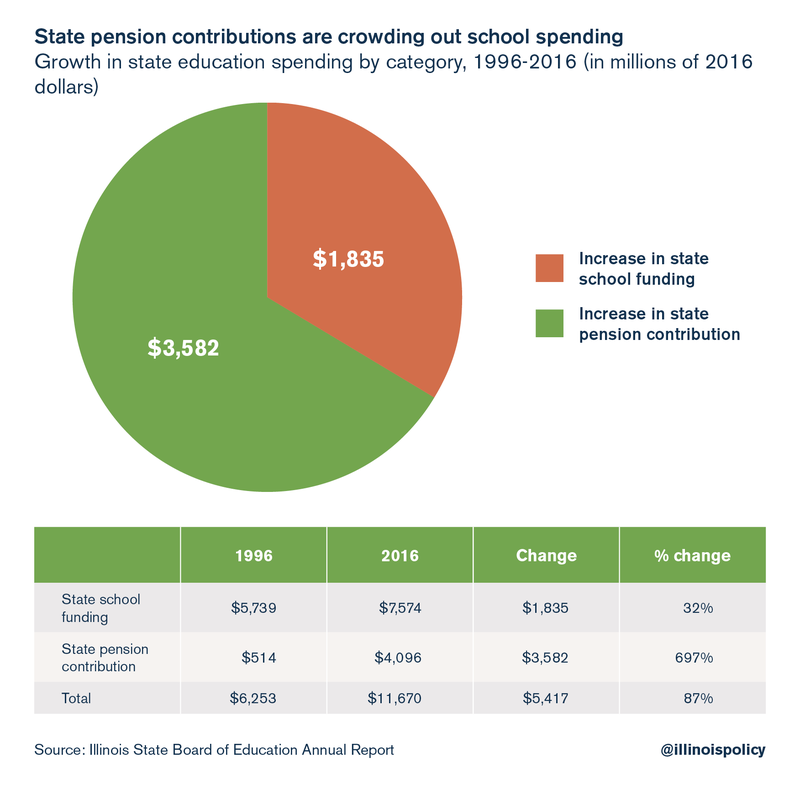 What these critics often fail to address, however, is the key role of rapidly rising pension costs in how the state is able to fund its schools. It is the irresponsible growth in teacher pension costs eating up scarce state dollars for education – not a lack of state money going toward education in general – that is driving local school districts to hike property taxes. Although school district employees such as teachers and administrators are not state employees, the state government pays into the Teachers’ Retirement System, or TRS, on behalf of school districts. And while the state increased education funding by $5.4 billion in the past 20 years, 66 cents of each additional dollar went to pensions, not schools. 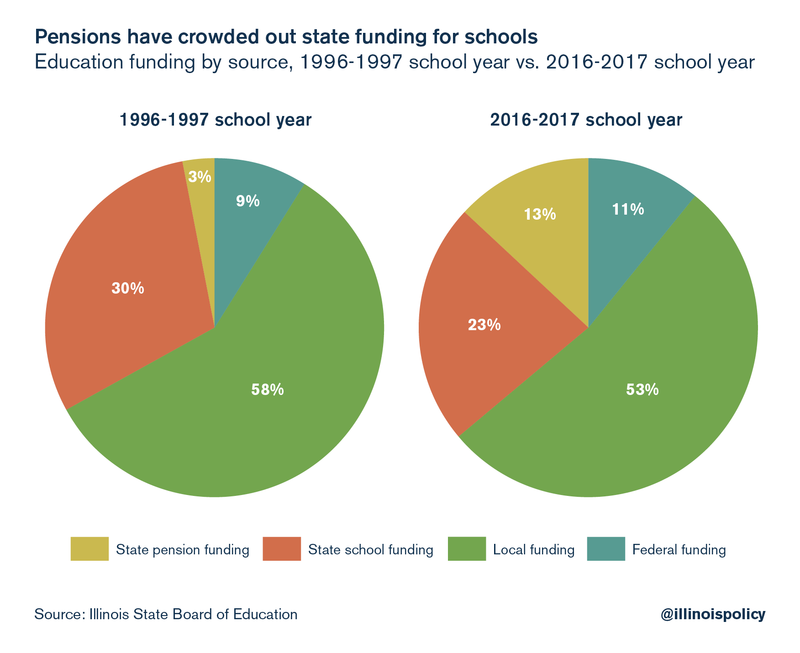 Opponents of cost-saving reforms also fail to consider that the state actually contributes a larger share of funding toward public schools today than it did 20 years ago, when factoring in pension spending. To put it simply, teacher and administrator pensions are crowding out state education funding, and forcing local homeowners to make up for the shortfall by shouldering an enormous property tax burden. And furthermore, promises of unaffordable benefits have left taxpayers on the hook for increasing unfunded liabilities despite huge influxes of tax dollars into pension funds. If property tax dollars are spent on services that improve communities, home prices should increase with the rise in property taxes. 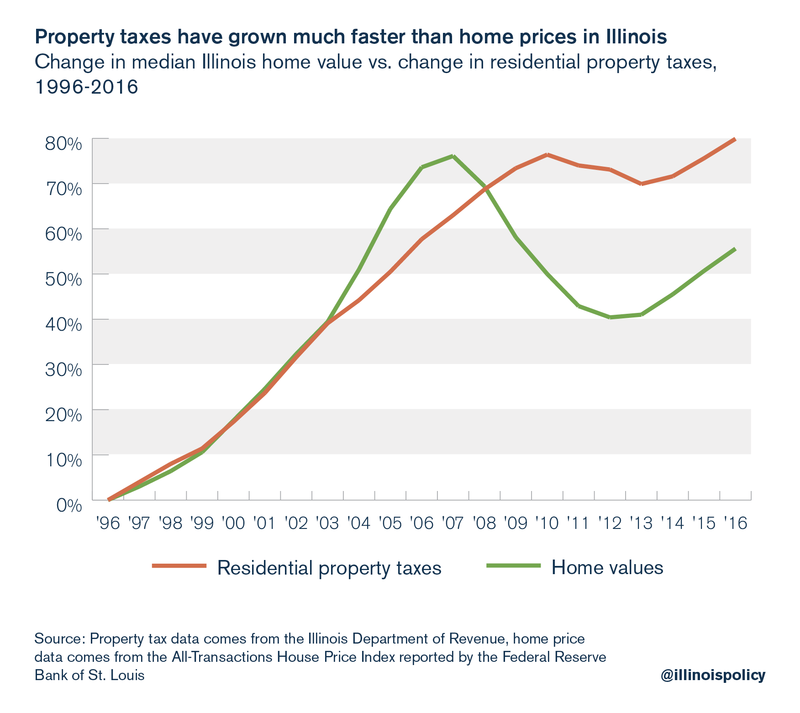 But this hasn’t been the case in Illinois, where property taxes have risen 43 percent faster than home values since 1997. One reason for this could be that more and more of Illinoisans’ property tax bills are going to pay for local government employee pensions every year. Property tax dollars that are paid to pensions aren’t being used to improve or provide public services. To the extent that these contributions go toward payments to current retirees, these tax dollars are used to pay for the provision of past services. Additionally, many pensioners no longer – or in some cases never did – live in the communities they served, so this money is being sucked out of those communities entirely, without going toward services that will raise property values. 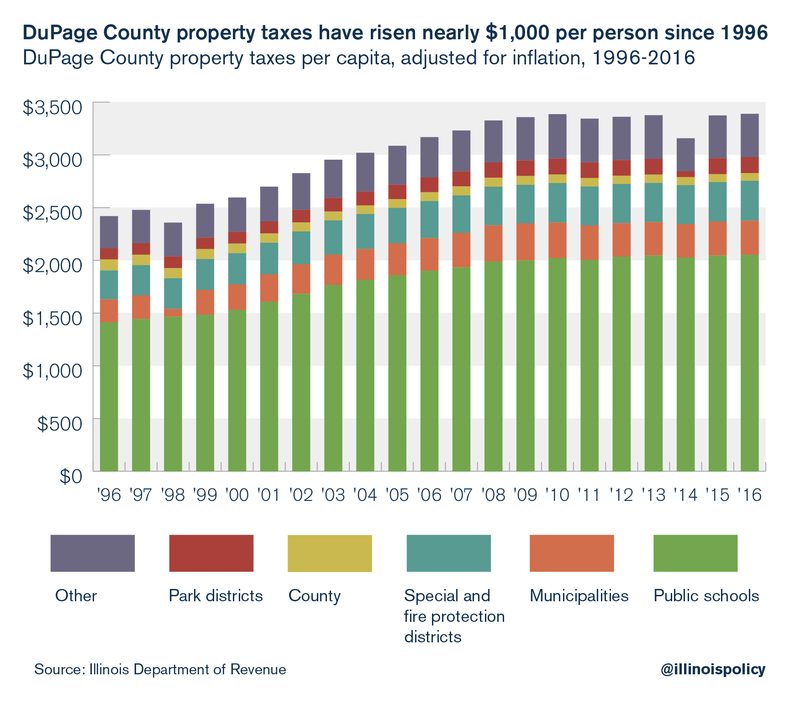 The share of property taxes that go to public pensions rose 125 percent in Cook County, 107 percent in DuPage County, 108 percent in Lake County and 93 percent in St. Clair County from 1996 to 2016. Most local government employees – excluding school teachers, firemen and policemen – pay into the Illinois Municipal Retirement Fund, or IMRF, which has a statutory funding requirement. This requirement ensures that the IMRF pension share of property taxes remains relatively constant over time. However, municipal firefighters and municipal police officers have separate pension funds for each district, not one fund such as the IMRF. As a result, these funds do not have the same type of uniform funding requirement16 and have been historically underfunded. The growth in Illinois’ local government pension liabilities has forced many municipalities to increase their pension contributions. 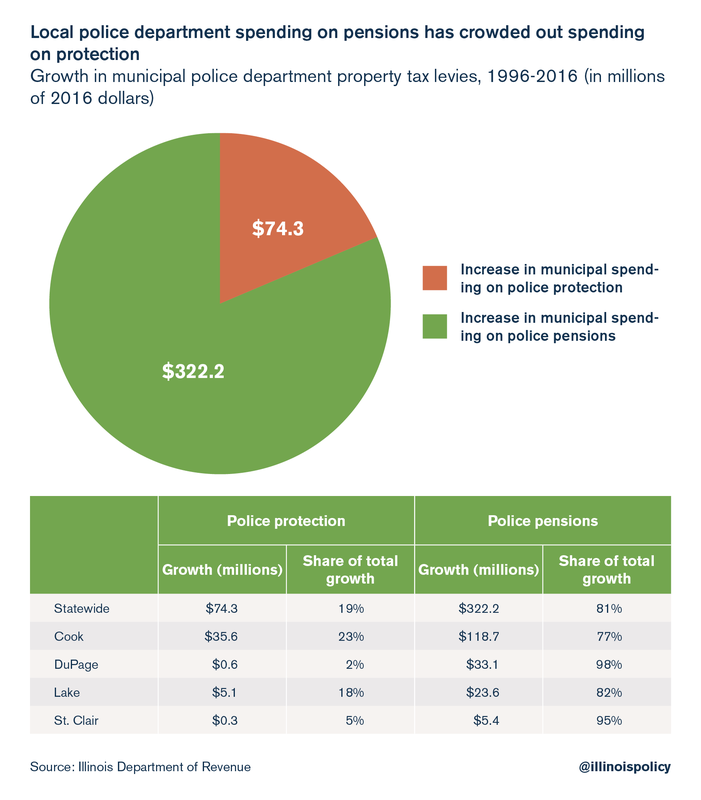 Municipal police departments are spending less and less of the property taxes they collect on protective services, and more on pensions. Municipal fire departments are also spending less and less of the property taxes collected on protective services, and more on pensions. In Lake County, only 18 percent of municipal property tax dollars raised for fire departments is actually spent on protecting the community from fires. This is not to say that municipalities aren’t spending more money on fire protection than in the past. In fact, they are spending more money on fire protection in each county examined, except for Lake County. Residents can expect property taxes to keep rising as municipalities try to prevent pensions from crowding out the delivery of local services. Pension costs have grown far more than spending on services. Municipal spending on firefighters’ pensions grew by $80.5 million in Cook County, $15.1 million in DuPage County, $12.6 million in Lake County and $2.5 million in St. Clair County from 1996 to 2016. Local taxing bodies have been asking for more and more money from taxpayers over the past 20 years. But where have those additional property tax dollars gone? In short, not toward maintaining local services. While taxpayers expect their property tax dollars to provide essential services, only 11 cents of every additional dollar has gone to maintain the 1996 level of services, adjusted for changes in the cost of living and population growth. Meanwhile, 52 percent went to pay for pensions, employee benefits, bonds and interest, and 37 cents went to other local government spending, which includes things like additional salaries, expanded payrolls or increased services.25 If Illinoisans today were only getting everything they were getting in 1996 and passed on the savings to homeowners, the average state property tax rate would be cut by more than half. The amount of tax dollars that do not go to services will do less to improve home values. In fact, a rise in property taxes without improvements in the quality of services can be detrimental to appreciation in home values. Property taxes should provide for amenities that make neighborhoods an attractive place to buy a home and put down roots, such as public safety and education services. This is not what is happening in Illinois. Municipalities differ enormously in their levels of local public good provision and private investments across Illinois. Some localities have excellent public schools and other public services. Other locations, however, are confronted with appalling public services, less private investment and decay. The willingness and ability to pay for these services, as well as preferences for some services over others, varies across households. That means if property taxes increase, but those additional dollars do not add or improve services, property values will decrease. This proposition has important implications for the provision of local public services: for example, pension payments to retirees aren’t expected to raise home values as much as spending on the classroom. In short, payments to retirees can divert spending that would have gone to services that will improve home values. In addition, time on the market, or TOM, for sellers in Illinois is still much higher than the national average. This longer TOM coupled with declining sales is an indication that in Illinois, families find purchasing a home less attractive than in other states. While some experts remain optimistic,29 uncertainty over the state’s economic outlook coupled with Illinois’ rising tax burdens dampen price growth. As the state’s budget problems continue, and the costs of homeownership in Illinois increase, fewer families want to plant roots in Illinois. Rising property taxes that do not go toward beneficial services will depress the value of a family’s largest investment – a home. Illinois needs to stem the tide of tax dollars going toward costs that do not improve home values. That means dealing with Illinois’ public pensions. 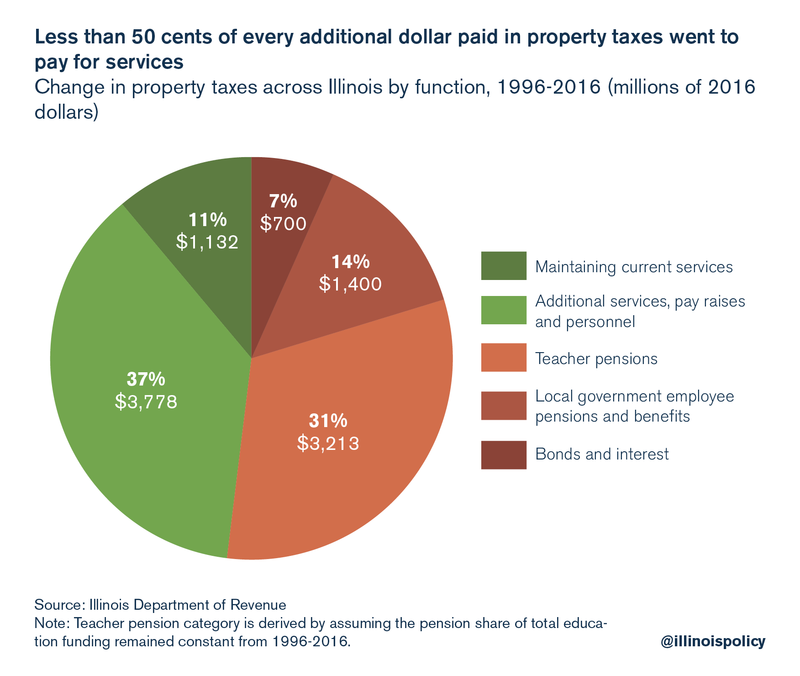 If Illinois and its local governments were able to reform their unaffordable pension systems and avoid the looming pension crisis, the state could contribute more money toward classrooms and reduce its overall spending, and localities could provide property tax relief. The implication is clear: Illinois lawmakers cannot seriously talk about property tax relief without addressing the pension problem. Homeowners are seeing less for their property tax dollars because pensions take a growing piece of the pie. 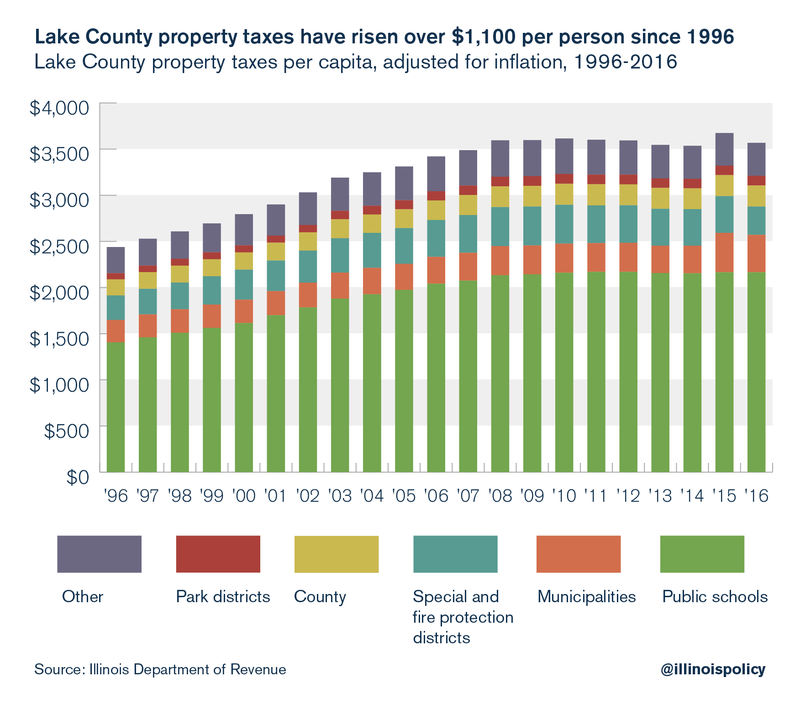 If Illinoisans want property tax relief without cutting services, state and local governments need to reduce taxpayers’ share of the pension burden. So far, the Illinois Supreme Court has been unwilling to allow any reforms in current pensions. It is increasingly clear that the only chance Illinoisans have is to amend the Illinois Constitution. At some point, enforcing the pension protection clause violates the obligation the state has to protect the rights of its citizens at large, depriving them of the most fundamental government services. Public pensions have been overpromised and underfunded.32 That said, taxpayers were never going to be able to afford 3 percent automatic annual cost of living adjustments33 or benefit promises that compound 8.8 percent every year.34 Due to these unsustainable benefits provided in the defined-benefit plans given to public workers, taxpayers are forced to pay more of their tax dollars to pensions every year. Despite contributing 697 percent more to teacher pensions, 300 percent more to policemen and firemen’s pensions, and 38 percent more to the IMRF, these pension funds have become less and less solvent. Politicians’ overpromising has left taxpayers on the hook for massive unfunded liabilities. 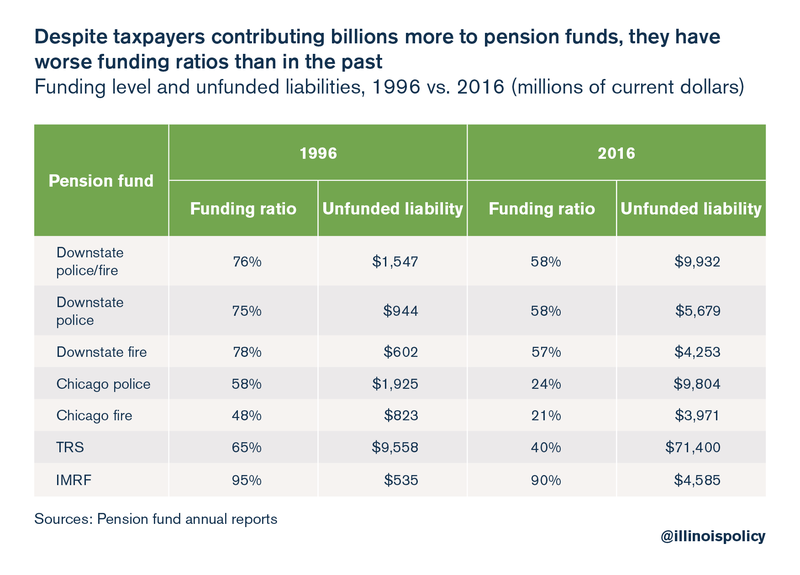 In the past 20 years, taxpayers have contributed billions of dollars to these pension funds, yet their funding ratios are significantly lower. If this trend continues, taxpayers will be left holding the bag – forced to pay more in income and property taxes each year for little in return. Illinois homeowners are in desperate need for property tax relief. 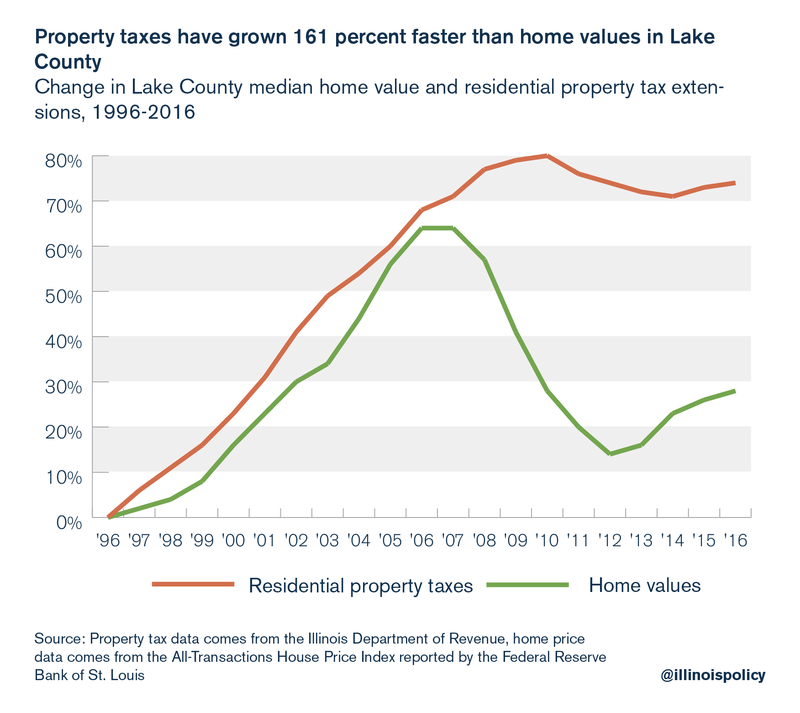 Over the past decades, Illinois property taxes rose even while home values struggled to recover. State and local government employee pension costs largely drove those rising tax bills. Pensions have crowded out state spending in education and local spending on police and fire services, and the burden to pay those extra costs has fallen on homeowners. If Illinois is serious about providing meaningful property tax relief, the state must deal with its pension crisis. Whether in the form of legislation, a constitutional amendment or a Supreme Court decision, property tax relief can only happen alongside a decrease in Illinois’ pension liability. Any reform that fails to reduce the burden of pension costs on taxpayers ignores the root of the problem. Any meaningful property tax relief for Illinoisans means reforming Illinois’ unsustainable public pension system. Dennis Carlton, “Why New Firms Locate Where They Do: An Econometric Model,” Interregional Movements and Regional Growth (Washington D.C.: The Urban Institute, 1979). Timothy Bartik, “Business Location Decisions in the United States: Estimates of the Effects of Unionization, Taxes and Other Characteristics of States,” Journal of Business and Economic Statistics, no.3 (1985). Ronald C. Fisher, Timothy J. Bartik, Harley T. Duncan, Therese McGuire, and Robert M. Ady, “The effects of state and local public services on economic development,” New England Economic Review (1997): 53. M. Wasylenko, “Taxation and economic development,” New England Economic Review (March/April 1997): 37-52. Illinois Policy Institute calculations using data from the Illinois Department of Revenue. C. Bai, Q. Li, and M. Ouyang, “Property taxes and home prices: A tale of two cities,” Journal of Econometrics 180, no.1 (2014): 1-15. Illinois Policy Institute calculations based on Illinois Department of Revenue Property Tax data and the All-transactions House Price Index provided by the Federal Reserve Bank of St. Louis. “Property Tax Statistics,” Illinois Department of Revenue. 2016 Annual Report, Illinois State Board of Education, January 2017. Annual Financial Report Summary, Teacher’s Retirement System of the State of Illinois, 2017. Ted Dabrowski and John Klingner, “What’s driving Illinois’ $111 billion pension crisis: Retirement ages, COLAs, and out of sync pension payments,” Illinois Policy Institute, April 2016. Ted Dabrowski, “Illinois pensions: Overpromised, not underfunded,” Madison-St. Clair Record, February 6, 2018. Leigh Linden and Jonah E. Rockoff, “Estimates of the Impact of Crime Risk on Property Values from Megan’s Laws,” American Economic Review 98, no.3 (2008): 1103-27. Allen Lynch and David Rasmussen, “Measuring the impact of crime on house prices,” Journal of Applied Economics 33, no.15 (2001): 1981-1989. Richard Thaler, “A note on the value of crime control: Evidence from the property market,” Journal of Urban Economics 5, no.1 (January 1978): 137-145. Bai, Li, and Ouyang, 2014. Illinois Policy Institute calculations using data from the Illinois Department of Revenue and the Illinois State Board of Education. “S&P CoreLogic Case-Shiller Home Price Indices,” 2018. “Housing Price Forecasts Illinois and Chicago PMSA, March 2018,” Regional Economics Applications Laboratory, March 21, 2018. IL Const. Art. XIII, § 5; Art. XIV, § 3. Adam Schuster, “Harvey pension crisis leads to mass layoffs,” Illinois Policy Institute, April 11, 2018. Ted Dabrowski and John Klingner, “Illinois State Pensions: Overpromised, not underfunded – Wirepoints Special Report,” Wirepoints, March 29, 2018. Dabrowski and Klingner, “What’s driving Illinois’ $111 billion, pension crisis” 2016.